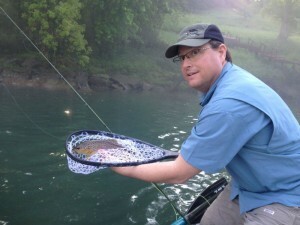 It has been a wonderful Memorial Day holiday weekend with lots of friends, family and plenty of good fly fishing. We got to spend one day with some long time Fort Smith friends Brian and Gregory DeLung. This fly fishing trip was birthday gift from Gergory to his dad, Brian. 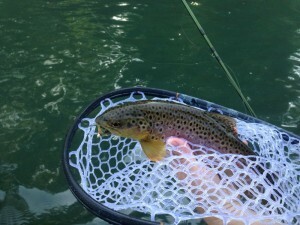 Somehow there is just nothing better than father and son fly fishing trips! Both of these guys are accomplished fly anglers and they applied their skills in grand fashion on this trip. The morning started cool and very foggy on the Little Red River so we decided to show them some streamer patterns which quickly produced a nice Brown Trout for the birthday boy. As the fog burned off we switched to some nymphs and the boys continued to pick off some nice Rainbows on #14 gray Sowbugs, RG/PT Cruisers and #20 olive Zebra Midges. All in all it was a super day topped off with homemade chocolate chip cookies for the birthday boy.